The technology sets new standards - the design combines exclusivity and performance. Two strips of fine, handmade leather flank the polished glass on the back and offer you the perfect grip. This natural leather was selected for its excellent durability and softness - two important features to give you a luxurious experience. Maximum power is supplied by the chipset Kirin 980, which is fabricated with leading 7nm process technology - high performance and energy efficiency in its perfection. The integrated triple camera from Leica comprises a 40MP RGB sensor, a 20MP ultra wide-angle lens and an 8MP sensor with a telephoto lens. The ultra wide-angle lens supports video capture in ultra wide 21:9 resolution for a unique cinematic feeling. The safety features of your Porsche Design Huawei Mate 20 RS combine speed with innovation: Fast as lightning in-screen fingerprint sensor. 3D Face Unlock, which identifies your face through a thousand projected infrared dots under 0.6 seconds. Huawei SuperCharge Technology 2.0 and the 40W adapter can recharge the 4.200mAh battery with super-fast speed. Your smartphone supports wireless charging and you can use it with Huawei Wireless Reverse Charging as a wireless power bank for other Qi-enabled devices. 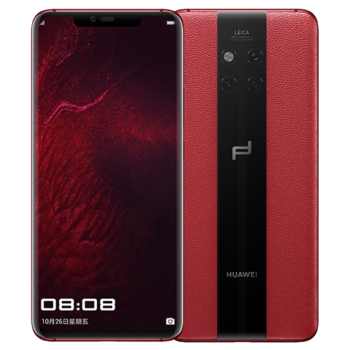 The leather flip cover is the highlight among the included extras and gives you a glimpse of the important information on your display while protecting your Porsche Design Huawei Mate 20 RS in a fashionable way.